Here at Furniture Clinic, we strive to deliver superior customer service. Whether it's providing information on a product or helping a customer determine what products are needed for their restoration, our goal is to always put our customers first. One common occurrence we see are customers being unsure of what products they need for their leather type. Depending on your leather type, you may need products specialized for Absorbent or Non-Absorbent type leathers. There are many types of leathers and they each can have different levels of absorbency. Some leathers may have a protective coating (finish) on top that is applied by the manufacturer and are typically non-absorbent. Others have no protective coating over them and are typically absorbent type leathers like aniline leather. There are even leathers that can be semi-absorbent like semi-aniline leather. With all these types of leather, you may not know what type you have or what products are needed to restore your leather. Well the debating can be over! We have a simple Water Test you can perform that will determine the absorbency of your leather and help you narrow down the proper products for your leather restoration needs. We advise to perform our Water Test on a section of your leather that is undamaged. That means somewhere where there is no color-loss, fading, scratching, cracking, scuffs, etc. You want to perform the Water Test in an area that still has good color and no damages for accurate results. Now it's time to apply the water onto your leather. All you need is one or two drops of water to perform this test, so you may use a spoon or your fingers to apply the water onto your leather. Using too much water can leave a water mark on your leather, so make sure to use only one or two drops when performing this test. Time to see the results! If the water you placed on your leather beads up on the surface or rolls along the surface without absorbing in, that indicates you have a Non-Absorbent type leather. If the water immediately absorbs into the leather and even darkens the leather in the absorbed area, that indicates you have an Absorbent type leather. 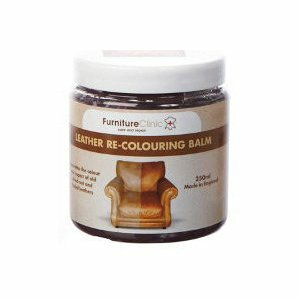 Our Leather Re-Coloring Balm will allow you to restore color back into your leather possessions. From cat scratches to fading from sun exposure, our Leather Re-Coloring Balm is a simple yet effective way to bring your leather back to life. To restore color to your non-absorbent type leather, you have two different options you may choose from. For smaller areas, you can use our Leather Touch Up Kit where you simply choose a base color that closely reflects your leather and our kit provides you with additional tints to mix and match your exact color. The kit also comes with a Gloss and a Matte Finish so you can match the exact finish of your leather. 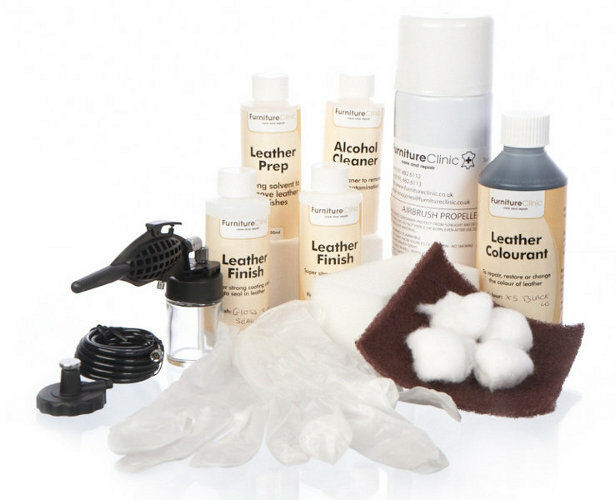 For larger areas, our Leather Colorant Kit will provide you with all the necessary products to prep your leather by removing the manufacturer's finish, apply new color to your leather using our Leather Colorant and, finally, applying a new finish to your leather using our Leather Finish. Our Leather Colorant Kit comes in four sizes and you can choose from a variety of colors on our Standard Color Chart. We also offer a Color Matching service where all you need to do is provide us with a sample of your leather, at least the size of a nickel, and our Color Technician will be able to match the exact color and finish of your leather. Step 5: Time to restore! Once you've performed our Water Test and found the correct products for your leather type, you can start restoring! We always recommend using our Leather Ultra Clean (click here) before any restoration to ensure your leather is clean from any dust or dirt that may have settled on the surface of your leather. After restoring, you want toÂ apply our Leather Protection Cream to your leather which will feed, nourish, and use its advanced barrier technology to help repel future staining to your leather. Both products come in our Leather Care Kit and can be used every three months as general maintenance to clean and protect your leather for years to come.